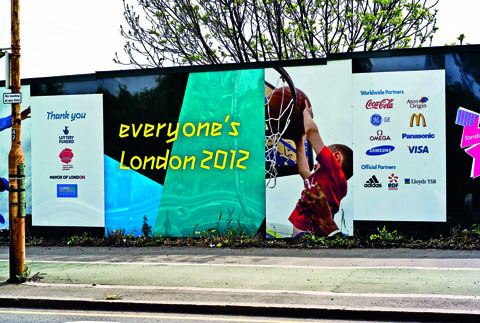 Organisers of the 2012 Olympics are under fire amid claims that amateur photographers have once again been targeted by heavy-handed security guards at the stadium building site in East London. Photo enthusiasts Louis Berk and friend Steve Kessel say they clashed with four security personnel while on a ?public pavement? outside the construction area. Louis claims they were intimidated. ?I believe the only reason, for what can best be described as an attack by security staff, was that we were carrying cameras,? he told us. It appears the pair were accosted after guards mistakenly believed they had been taking pictures of the construction site through a hole in the fence. The alleged incident occurred near the Eastway slip road in Hackney Wick on Saturday 3 May. Louis claims they had only been looking at the site, and were curious about the progress of building work there. Despite having only taken photos of areas outside the site boundary (see picture below) the guards demanded they both produce identification and stand behind a barrier. ?The interrogation then turned to the content of our cameras,? said Louis, who lives in north London. ?The leader of the pack told us we were not allowed to photograph security staff and demanded we show him the pictures. Neither I nor my friend had taken any pictures ? in fact, my friend was using a film camera so it would have been impossible to comply with this illegal request.? In a letter to Olympic Delivery Authority (ODA) chief executive David Higgins, Louis accused the authority of operating the equivalent of a ?private militia?. In a written response to Louis, dated 15 May, Higgins said that a ?detailed investigation? into the incident was now underway. As we went to press, Louis was setting up a meeting with the ODA. The ODA had yet to respond to our request for comment.
? For the full story ? plus reaction from Austin Mitchell MP – see the next issue of Amateur Photographer, in shops on Tuesday 3 June and available to subscribers from tomorrow (31 May).